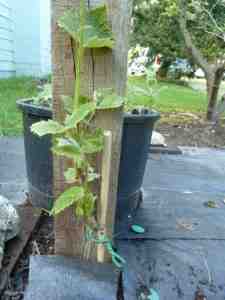 My Home and Garden: Planted a Niagara Grape. In the greenhouse I still have a cutting of a lovely grape that Karen gave me. It is growing nicely, but I did worry that I wasn't seeing roots on the pot bottom. Sometimes woody cutting give one the impression that they are rooting and growing when in fact they are just sending out leaves or flowers like forcing forsythia flowers. So just to hedge my bets, I bought a Niagara Grape. I had one, wow, it must be 25 years ago. But I gave up on the clay gardening and I took it out before I got any grapes. So when I saw one, I grabbed it. I was at the Muse Winery last week and I saw that I did indeed have room for two grapes. So today I planted the Niagara Grape. Later I went to the greenhouse and flipped the rooting grape over to have a look. Of course...it looks like little roots coming out the bottom of the pot. I'm going to have two grape vine espaliers!! That's great, good for you. Didn't know you could buy vines from wineries! Do they sell cuttings from their own vines as well? Best of luck with them. Sorry, I didn't say it well. What I meant was...I was at the Muse Winery and really looked at their plantings. The spacing the height, etc. I realized that I could fit two vines in the space I have. Yayyyy.